Held at the VanDusen Garden’s Floral Hall, Saturday August 24th, 2019, 10am to 4pm. Repotting demos at 11am, 1pm and 2pm. VOS Culture Class: Held at the VanDusen Garden’s Floral Hall, every 2nd Tuesday, monthly except for January, July, August and December. Classes start at 6:30 pm and members are encouraged to bring their questions. 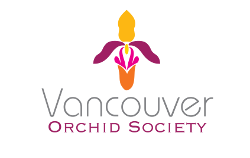 Every 4th Wednesday – VOS Monthly Meetings: Held at the VanDusen Garden’s Floral Hall, every 4th Wednesday monthly except for July, August and December. Meetings start at 6:30 pm and members are encouraged to bring their flowering orchids for judging by accredited judges. We always feature guest speakers on various topics of interest. You can expect raffles and sales of orchids by vendors as well as a members’ coffee/tea social & to mingle with other orchid enthusiasts. See “ABOUT US” Page & Click “SPEAKER SERIES”.